Posted byhundredriver	 November 29, 2017 Leave a comment on Christmas Market Announcement! With Christmas just around the corner it’s the time of year when you’d be mad to skimp on the seasonal local produce and artisan goodies available at Beccles Farmers Market in December. There will be markets on Saturday the 2nd and the 16th December with a special market for you to collect those last minute Christmas orders held on 23rd with reduced stallholders (mainly food only). The 16th December market will feature a special guest appearance from Hundred River Folk Band. We’ve got a full house with lots of returning stallholders and some more new ones. Alongside the new Christmas and craft stalls with handmade wreaths, decorations and smellies, we will have Rob Rutterford with his unique pottery and Spinspired with their hand weaved wool products. Dann’s milk and artisan ice-cream will be back and Hall farm will have some game meat alongside their coloured eggs, cream and raw milk, not to mention The Perfect Crumb with lactose free brownies and other brownies and flapjacks from Made with Love. 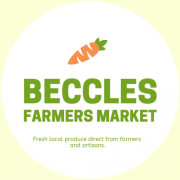 If you would like to pre-order anything for the 23rd then please do so at the next market or find and contact the relevant producer through www.becclesfarmersmarket.co.uk. For all other enquiries please call Margarett Hall on 01502 476240.